After studying classical music in her youth, Sonja Moonear set aside the piano in favour of the turntables and bought a Roland R8. Surrounded by the Swiss mountains, Sonja immersed herself in the Geneva underground before finally infiltrating the ranks of the Weetamix residents in 2002. From that point on, participating in ever more ambitious projects, she was tapped by an international agency and started the road trip. Moonear slowly began collaborating with various artists - friends and crews - and along with Dandy Jack as Junction SM. She has acquired an impressive international reputation, playing in clubs and festivals worldwide. In the last couple of years she’s been releasing her own tracks and remixes on renowned international labels such as Karat and Perlon. She runs the label Ruta5 and organises various events in Switzerland. On top of that, she is a sound designer for the swiss-french TV. From classical training to technics and machines, the jet-setting Sonja Moonear has built a long running career as a DJ and producer with a reputation for discerning disc selection and a flair for funky leaning techno. Enticed by Geneva’s squat scene in the early 90s and lured secretly out of her parent’s home at night by the subsequent blossoming of electronic culture coalescing around the Weetamix club, Moonear began her indoctrination into the dark arts of dance music. 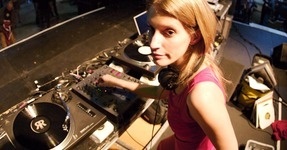 She hit the decks in the early 00s, connecting first with a local scene that included the Swiss-based techno children of Chile’s diaspora: the Schopfs — Dandy Jack and Chica Paula, Luciano and eventually Ricardo Villalobos and the whole community that opened onto the Perlon label and family of artists, which she credits as a major catalyst in developing her own aesthetic. With then partner Martin Schopf, they became Dandy Jack and The Junction SM, a recording project and an epic hybrid live act combining his computer triggered beds with her selections from vinyl. A release on Perlon came out in 2005, and 12"s under her own name starting flowing in 2010. While she holds down another job as a sound designer for Swiss TV, Moonear has managed to squeeze in notable sets at every club and festival that matters, and is known for her empathetic connection with crowds and her profound and joyful understanding of music and motion. 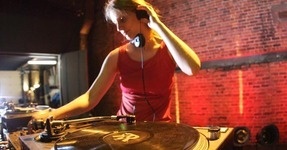 An alumni of RBMA, Sonja Moonear participated in the Sao Paulo Academy in 2002. After studying classical music in her youth, Sonja Moonear set aside the piano in favour of the turntables and bought a Roland R8. Surrounded by the Swiss mountains, Moonear immersed herself in the Geneva underground before finally infiltrating the ranks of the International Deejay Gigolo label in 2000. From that point on, participating in ever more ambitious projects, she was tapped by the Escorteaze agency. Moonear recently began collaborating with artists like Luciano and Dimbiman/Zip, along with Dandy Jack, and she has acquired an impressive international reputation, playing in clubs worldwide. Her musical background, eclectic tastes and enviable record collection have made Moonear a much sought-after DJ.